- Colors: clear, tan, yellowish, red, multicolor and printed so on . We have been indulged in providing quality BOPP Self Adhesive Tape to our esteem clients. These tapes are available at budget friendly price. Length: 45,60,90,120,180,/ and any further length..
We are offer a high quality range of Bio-axially Oriented Polypropylene Tapes. These are made from best materials ensuring superior quality. Our products have water resistant acrylic adhesive on one side for stronger holding and adhesion power. 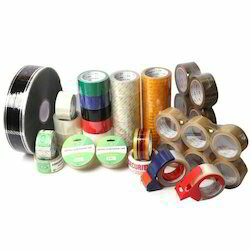 We are a prominent manufacturer and supplier of BOPP Film & Tapes. Our presented series of BOPP Adhesive Tape is enormously demanded in the market for their long-lasting nature and superior finish. EZ-BOPP-23/25 is Bioxially Oriented Polypropelene (BOPP) Film coated with water based adhesive in with 25micron coating thickness. Printing of single and multiple colours is also possible with logo or customized design. 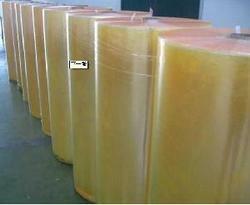 » It is very good for carton box sealing and for stationery purpose. Our firm specialize in offering BOPP Tapes, which is made with qualitative materials. Offered self adhesive tapes are acclaimed by customers for their high adhesive strength, fine finish, attractive color and smooth texture. Our BOPP Tape is widely used in Packaging and paper processing Industry.